Grayson and I were at the Decatur High School football field, but we didn’t see a touchdown or a first down. We watched drone races at the back of the field where competitors would line up in twos and threes to race around the course, getting points for each successful lap. 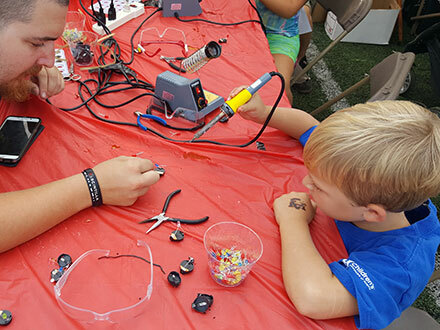 That was awesome but not my son’s favorite part of the Atlanta Maker Faire. Grayson built a circuit with an LED light and battery and did quite a bit of soldering. 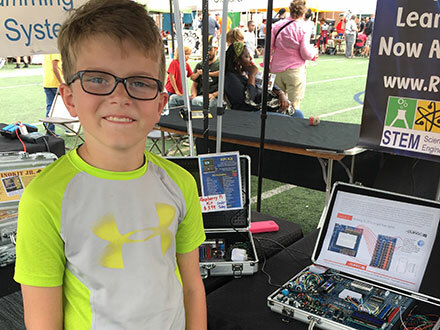 I have to give it to the person manning the booth, that was pretty brave to let a 7-year-old have his fingers that close to a hot soldering iron. When we have fun, we learn more and learn faster. Ironically, the jocks didn’t own the field that Sunday. It was taken over by the geeks that aced math and science. The kids that you would find building bridges in Shop Class. And the ones that went to Art Club after school. That day wasn’t about physical strength or endurance. It was about intellect and creativity. There were over 150 tents with everything from a Jell-O piano and metal workers making tiny swords from nails to robotic claws that let you ‘mine’ for candy. We spent the day with my good friend Steve, or Ardis as he’s known at the office, and his son Ryan. Watching the boys discover and learn the basics within the fields of mathematics and engineering took me back. Grayson with a soldering iron building some cool stuff! 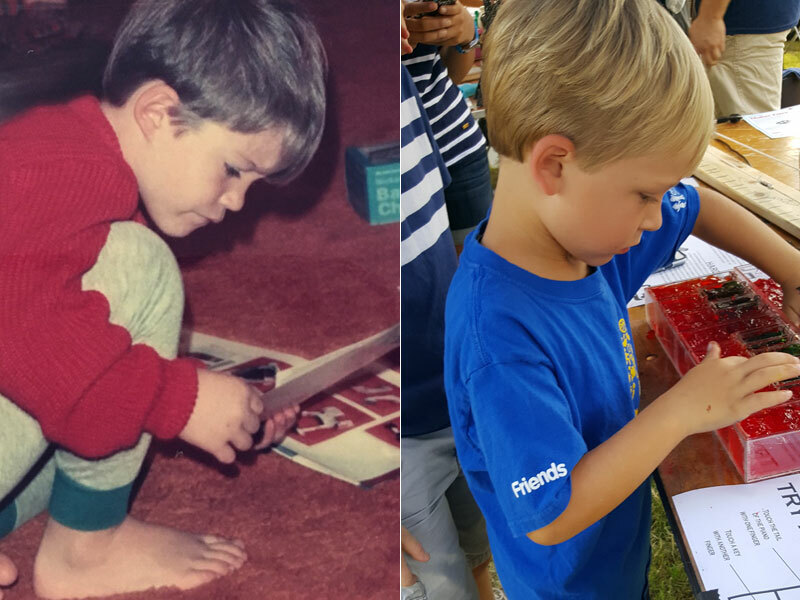 We soon realized how our sons are just like us. They love to build, work with hot soldering irons and are fascinated by flying electronics. Growing up in the LEGO, Tinker Toys, and Lincoln Logs generation I would spend hours building. I think this started me down the path towards math and science. 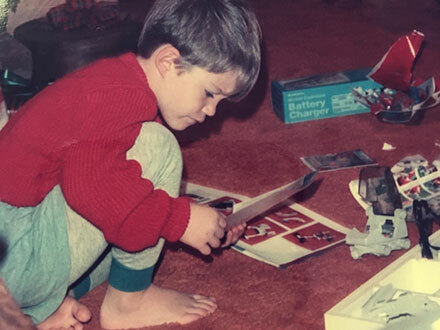 One Christmas morning, when I was about Grayson’s age, I remember opening up my Robotix set eager to put it together. Fun at the time, but not as cool as Dash and Dot robots that Grayson got last Christmas. I also remember getting a TRS-80 and writing my first program to see what I could make or how to modify games to win. I know what you’re thinking, that’s cheating but really, isn’t it just being clever? And clever is another word for smart, right? Today, modifying games is the norm. Mods, as they are known in Minecraft, are incredibly popular. Gamers (a.k.a, closet programmers) don’t just want to build in a Minecraft world they want to create new versions of the world. This generation is learning fundamental programming skills through what is perceived as playing or to put it another way…just being a kid. Eagar minds can join Code Kingdoms which lets aspiring modders learn to code while building whatever they can imagine. Picture walking into your son’s or daughter’s room and seeing a black screen filled with lines of code and hearing the clicking of keys as they are building their own world, not by dropping blocks but by writing code. When we have fun, we learn more and learn faster. That was true decades ago when we used those interlocking 2×2 and 2×4 blocks to create many different things. Just as it is true today if you’re building with Redstone. The concept of using building blocks in code is the very essence of building great software and scalable solutions. 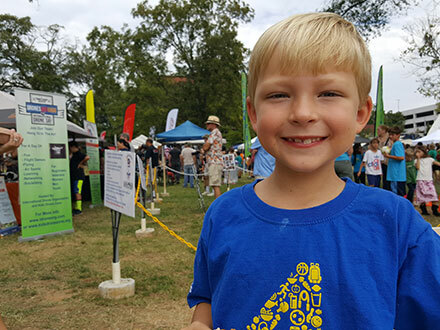 Ardis and I had a blast at the Maker Faire with Ryan and Grayson. We also realized how our sons are just like us. They love to build, work with hot soldering irons and are fascinated by flying electronics. I think it’s fair to say we’re raising our replacements and the next generation of engineers.